As hours are going by Priyanka Chopra and American singer Nick Jonas’ formal engagement announcement seems nearer! 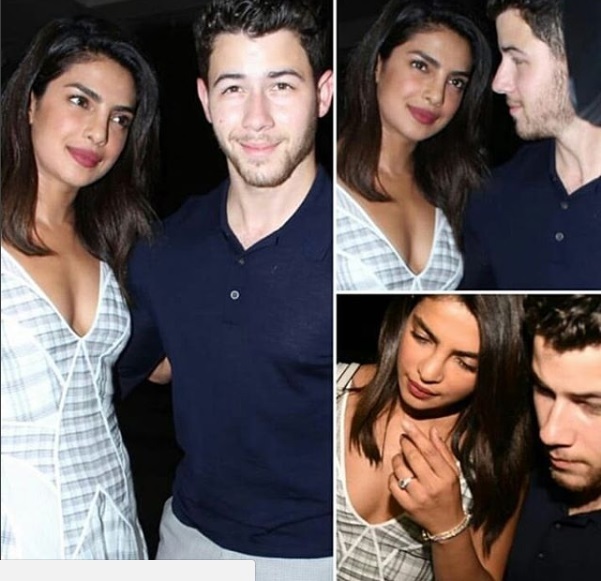 The news of their rumoured engagement became a confirmed news when Priyanka Chopra was spotted wearing a pretty rock on her ring finger at Manish Malhotra’s bash and also when Nick Jonas along with his parents arrived In Mumbai. Does this mean that Priyanka Chopra and Nick Jonas are indeed hosting an engagement party on August 18? If rumours are to be believed— yes! 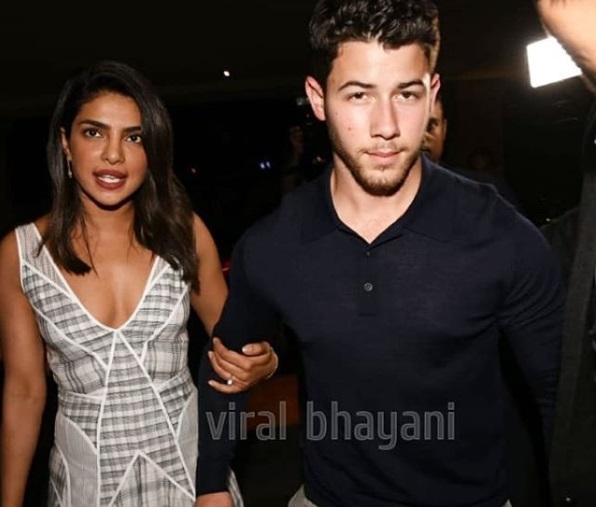 In fact, last night on August 17th Priyanka Chopra and Nick Jonas entered a five-star hotel in Juhu hand in hand. 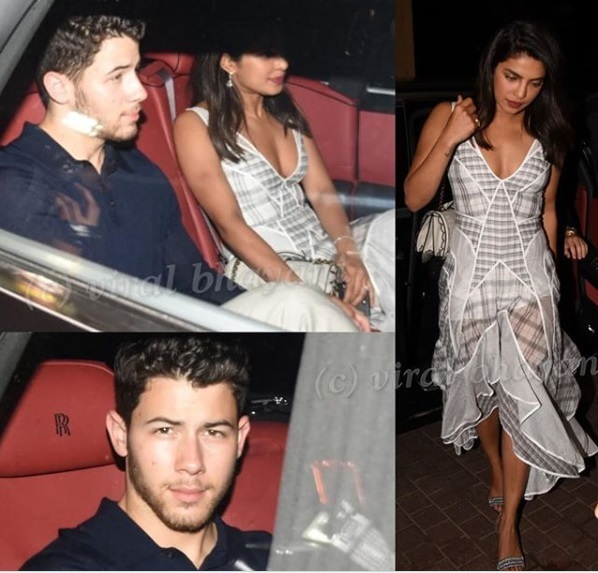 Nick Jonas’ parents Denise Miller-Jonas and Paul Kevin Jonas along with Priyanka Chopra’s mother Madhu Chopra also joined the couple for a pre-engagement dinner. While everyone entered Juhu’s J.W. Marriot Hotel at different times one thing was common between them. All of the Jonas’ and Chopra mother-daughter duo were sporting radiant smiles. However, while entering the hotel one can see that Nick Jonas’ parents were clearly out of their element. Maybe it will take few more trips to India for them to get used to the media frenzy here? While everyone is busy talking about PC’s rumoured engagement it has not slipped our keen eyes that Priyanka and Nick are so in love. While getting photographed at the hotel the couple could not keep their eyes off of each other! Aren’t they the cutest couple around? In the meantime, preparations are underway at the Chopra residence in Mumbai. Reports note that the house is being decorated and that a pandit was spotted entering the premises. Does this mean that Priyanka Chopra is having a roka/engagement party? Now that we are talking about the engagement party— as per previous reports Priyanka has asked her family and friends to set aside sometime on Saturday August 18th. Naturally, it is to be understood that Nick Jonas’ parents along with Priyanka Chopra’s mother, brother Sidharth and cousin Parineeti Chopra will be attending the party. As per a report in the Times Of India, Priyanka Chopra has booked nearly 200 rooms at famous hotel in Mumbai for her guests’ comfort. Priyanka’s ‘Bajirao Mastani’ co-star Ranveer Singh, ‘Takht’ director Karan Johar, Raveena Tandon, designer Manish Malhotra, Sophie Chaudhry and business tycoon Mukesh Ambani are among the ones expected to attend the engagement party. Well, it looks like the Chopra-Jonas wedding is underway!